Headache causes nearly 5 million visits to US EDs annually and is the fifth most common cause of an ED visit. (Friedman 2014) Headache is sometimes attributable to a pathological process that can acutely threaten life or neurological functioning; identifying such a process is the primary responsibility of the acute care provider. Headache may also be related to a non-dangerous secondary cause, which often requires a specific acute treatment, such as sinus headache, which should be treated with decongestants, or strep throat, treated with antibiotics and anti-inflammatory medications. The focus of this chapter will not be on these secondary headaches but rather on primary headaches, that is, the various chronic episodic headache disorders that cause the majority of ED headache visits. (Friedman 2007) The list of primary headache disorders is extensive. (IHS 2013) This chapter will focus on migraine, the treatment of which is applicable to other primary headaches. We will also discuss two primary headaches that have distinct treatments, cluster headache and medication overuse headache. For patients who present to acute care with headache and desire symptom relief, the acute care provider should focus on analgesia at the same time that dangerous causes of headaches are specifically considered and excluded. Response to symptomatic therapy should not be the only determinant of diagnostic work-up, as heachache therapies are known to relieve pain from headaches of dangerous etiology (Edlow 2008). The diagnosis of a specific primary headache may be deferred to the outpatient setting, however, when symptoms strongly suggest a certain primary headache syndrome, patients benefit from this information and referral to appropriate resources. (Friedman 2016) Assigning the patient a specific headache diagnosis prior to treatment allows for a more elegant and nuanced approach to treatment. Migraine, the most common primary headache seen in the ED, characteristically presents with throbbing, unilateral pain associated with nausea, vomiting, photo and phonophobia. True aura is less common, though many patients describe visual or sensory phenomenon. Although it can be treated with the same parenteral medications as migraine, (Weinman 2014) tension type headache is essentially the opposite of migraine: a bland, bilateral headache, characterized by the lack of nausea and vomiting, and only rarely severe enough to cause an ED visit. Dozens of ED-based randomized clinical trials of migraine have been conducted over the last several decades providing a substantial evidence base on which treatment can be based. (Orr 2015) Two highly efficacious, disease-specific classes of medication have emerged: the triptans and the dopamine antagonists. Parenteral and oral NSAIDs are effective in acute migraine. Ketorolac, dosed at 15 mg IV or 30 mg IM, has a modest evidence base supporting use. (Taggart 2015) It is uncertain if the efficacy of NSAIDs in migraine derives from anti-inflammatory properties or merely by impeding nociception. Many clinicians employ a strategy in which these medications are combined with anti-dopaminergics or triptans. However, patients often arrive in the ED without having taken any medication at all for their migraine. In these patients, demonstrating the efficacy of an oral NSAID, such as ibuprofen or naproxen, may be instructive for the future treatment of the patient. More than half a dozen different types of triptan drugs are marketed in the US, though to date, the only available parenteral version is sumatriptan. (Loder 2010) These serotonin agonists were originally believed to relieve headache through cerebral vasoconstriction, which they cause, but it is more likely that they disrupt headache nociception within the cranial nerves and brainstem relay nuclei. Subcutaneous sumatriptan, dosed at 6mg, is highly efficacious, with a number needed to treat of two for headache relief. (Oldman 2002) In a multi-center, ED based study, median time to relief after receiving subcutaneous sumatriptan was approximately 30 minutes, meaning that more half of migraine sufferers can be placed in a chair, administered a subcutaneous dose of sumatriptan, and often will be ready to return to work before their registration is completed. (Akpunonu 1995) Unfortunately, subcutaneous sumatriptan has a number of common adverse effects, such as palpitations, flushing, chest discomfort, and paradoxical headache worsening. Also, headache recurrence after initial successful treatment is common with subcutaneous sumatriptan—as many as 2/3rds of patients will report moderate or severe headache in the 24 hours following initial successful treatment. Sumatriptan is also less likely to be efficacious as the acute attack progresses—it is best reserved for patients who present within an hour or two of headache onset. (Burstein 2000) Finally, triptans, because they have vasoconstrictive properties, should be used cautiously in patients with cardiovascular risk factors. Given all these concerns, subcutaneous sumatriptan is best reserved for those who have previously had good response to sumatriptan or those who cannot tolerate the anti-dopaminergics. Oral triptans including sumatriptan 100 mg PO, eletriptan 40 mg PO, and almotriptan 6.25 mg PO are reasonable treatments for patients who prefer oral treatment. These latter medications can be combined with oral NSAIDs, such as naproxen 500 mg PO, for added efficacy. Untreated, an acute migraine headache will linger for up to 72 hours. (IHS 2013) Many patients who present to an ED for management of migraine report continuing recurrent headaches in the days and weeks following the ED visit. Two-thirds of ED migraine patients report headache within 24 hours of ED discharge—half of these are moderate or severe in intensity. (Friedman 2008) Corticosteroids decrease the occurrence of moderate or severe headache post ED-discharge with a number needed to treat of nine and should be offered to all patients who have no contraindications to these medication. (Colman 2008) Corticosteroids do not result in rapid improvement in patients with an acute headache but it is likely that their effects will occur within a six-hour window. (Friedman 2007) Unfortunately, the optimum dose and duration of therapy is not clear. Dexamethasone 10 mg as a one time intravenous, intramuscular, or oral dose is a reasonable choice. Alternatively, patients may be discharged on a short course of oral prednisone (eg, 40-60 mg daily for three days). Opioids are the class of medication used most commonly to treat acute migraine in US EDs; (Friedman 2015) hydromorphone itself is used in 25% of all such ED visits. While they are effective analgesics, use of opioids should be discouraged for several reasons: 1) Opioids are less effective than other parenteral acute medication regimens. (Friedman 2008) 2) The ultimate goal of ED migraine therapy is to return a patient to work or school promptly, which cannot be done after opioid administration due to sedation and disorientation. 3) Opioids have been weakly linked to a variety of downstream headache-related sequelae including an increased number of ED visits, (Colman 2004) development of refractoriness to standard migraine medication, (Burstein 2004) and an increase in an individual’s average number of monthly headache days, (Bigal 2008) in addition to addiction, dependence, and overdose. Opioids should be relegated to the role of rescue medication for patients who have failed multiple other parenteral agents or for use, sparingly, in patients who have contraindications to other classes of medication. If opioids are indicated, intravenous morphine is an appropriate choice at an initial dose of 0.05-0.1 mg/kg. Hydromorphone is best avoided (see Use Of Opioids chapter, to be published). Several oral barbiturate combination medications are marketed as migraine therapeutics. As with opioids, these medications are linked to worsening of the underlying headache disorder (Bigal 2008) and should not be offered routinely in the ED. Patients who request an oral barbiturate combination should be counseled that these medications are likely to worsen the underlying headache disorder. Conflicting evidence precludes a recommendation in support of the routine use of intravenous magnesium. While some studies report benefit, others have shown no benefit or even harm. (Orr 2015) Magnesium is most appropriate for migraine patients with true aura, patients with low magnesium levels, or those who have failed to respond to other acute treatments. If intravenous magnesium is to be used, administer 2 g IV. DHE, an ergot alkaloid derived from ergotamine, has been used to treat migraine for decades. As triptans and anti-dopaminergics have emerged as effective and well-tolerated treatment of acute migraine, use of DHE has declined. (Friedman 2015) DHE commonly causes nausea. In clinical trials, it has often been combined with anti-migraine anti-dopaminergics such as metoclopramide, thus confusing analyses of efficacy. For patients admitted to an inpatient bed for treatment of status migrainosus, DHE is often administered around the clock in conjunction with an anti-dopaminergic as part of the so-called Raskin protocol. (Raskin 1986) For emergency clinicians, this medication is a useful second or third line therapy, in particular for patients who have not responded to anti-dopaminergics with NSAIDs. DHE 1 mg IV should be administered as a slow intravenous drip in combination with metoclopramide 10 mg IV. It should not be given to patients who have already used a triptan, patients with cardiovascular risk factors, and patients using macrolide antibiotics. Though evidence supporting this procedure does not yet exist, many headache specialists believe that a GONB with bupivacaine can relieve the pain of an acute migraine. Three milliliters of 0.5% solution can be administered adjacent to the greater occipital nerve bilaterally. The greater occipital nerve can be targeted 1/3 of the way down a line extending from the occipital protuberance to the mastoid process. For added efficacy, the lesser occipital nerve and the V1 distribution of the trigeminal nerve may be targeted as well. Efficacy is thought to relate to disruption of nociceptive transmission through brainstem nuclei, such as the trigeminal cervical complex, at which both the upper cervical nerves and the trigeminal nerve terminate. Cluster is a rare form of headache so, despite its severity, it is an uncommon cause of ED visit. Cluster is a severe, unilateral, peri-orbital headache. It is associated with autonomic features such as lacrimation, conjunctival injection, ptosis, or nasal congestion. Unlike migraine, patients with cluster feel restless and prefer to move rather than lie in a dark room. Cluster peaks in intensity quickly and does not last longer than three hours. Often, by the time the emergency clinician can see the patient, the headache has mostly dissipated. However, by definition, the acute headache is part of a headache cluster and will return again. Therefore, it is vital that the emergency physician address the continuing headache ailment. Most patients who present to an ED with headache have an episodic headache disorder that causes acute headaches infrequently. ED patients often report that they have only several acute headaches per year or several headaches per month. At the other end of the headache frequency spectrum are patients who have headaches on more days than not, patients who are frequently functionally impaired by their headaches, and patients who often cannot participate fully in work or social activities because of their headaches. Chronic migraine, a sub-type of migraine defined by 15 or more days with headache for at least three consecutive months, is experienced by 1-2% of the general population. (Natoli 2010) Often intertwined with chronic headache is medication overuse headache, a downstream complication of the primary headache disorders. Medication overuse headache, also experienced by 1-2% of the general population, is characterized by an upward spiral in headache frequency associated with an increased use of analgesic or headache specific medication (Kristoffersen 2014). Though acute relief is the goal for most patients who present to an ED with headache, when treating patients with chronic headache or medication overuse headache, it is important for the emergency physician to keep one eye on long-term outcomes such as recurrent ED visits and number of monthly headache days. Hopefully, care can be coordinated with an outpatient physician who knows the patient and is savvy about headache management. Chronic migraine should be treated with preventive medication, the goal of which is a modest decrease in the frequency and severity of acute attacks. Anti-hypertensive medications including beta-blockers, and calcium channel blockers can achieve this goal, as can antiepileptic medications including topiramate and valproic acid, and the tricyclic antidepressant amitriptyline. (Pringsheim 2012) Additionally, these patients should be on effective acute medication. The combination of an NSAID with an oral triptan or with oral metoclopramide is a reasonable starting point. For patients with medication overuse headache, discontinuation, generally through a slow taper, is required. This often requires referral, monitored discontinued use of the offending agent, substitution of a different acute medication, and initiating a preventive therapy. Patients who use opioids chronically and suffer frequent headaches are particularly likely to be harmed by opioids; opioids should therefore be avoided in this group. *Evidence is preliminary; these therapies are outside standard care. References for Table 2: Nicolodi 1995, Bigal 2002, Kapicioğlu 1997, Soleimanpour 2012, Friedman 2014. Recurrent primary headache after ED discharge is common. Akpunonu BE, Mutgi AB, Federman DJ, Volinsky FG, Brickman K, Davis RL, Gilbert C, Asgharnejad M. Subcutaneous sumatriptan for treatment of acute migraine in patients admitted to the emergency department: a multicenter study. Ann Emerg Med. 1995 Apr;25(4):464-9. Balbin JE, Nerenberg R, Baratloo A, Friedman BW. Intravenous fluids for migraine: a post hoc analysis of clinical trial data. Am J Emerg Med. 2016 Apr;34(4):713-6. Bigal ME, Bordini CA, Tepper SJ, Speciali JG. Intravenous magnesium sulphate in the acute treatment of migraine without aura and migraine with aura. A randomized, double-blind, placebo-controlled study. Cephalalgia. 2002 Jun;22(5):345-53. Bigal ME, Serrano D, Buse D, Scher A, Stewart WF, Lipton RB. Acute migraine medications and evolution from episodic to chronic migraine: a longitudinal population-based study. Headache. 2008 Sep;48(8):1157-68. Burstein R, Collins B, Jakubowski M. Defeating migraine pain with triptans: a race against the development of cutaneous allodynia. Ann Neurol. 2004 Jan;55(1):19-26. Burstein R, Cutrer MF, Yarnitsky D. The development of cutaneous allodynia during a migraine attack clinical evidence for the sequential recruitment of spinal and supraspinal nociceptive neurons in migraine. Brain. 2000 Aug;123 ( Pt 8):1703-9. Caviness VS Jr, O’Brien P. Cluster headache: response to chlorpromazine. Headache. 1980 May;20(3):128-31. Cohen AS, Burns B, Goadsby PJ. High-flow oxygen for treatment of cluster headache: a randomized trial. JAMA. 2009 Dec 9;302(22):2451-7. Colman I, Friedman BW, Brown MD, Innes GD, Grafstein E, Roberts TE, Rowe BH. Parenteral dexamethasone for acute severe migraine headache: meta-analysis of randomised controlled trials for preventing recurrence. BMJ. 2008 Jun 14;336(7657):1359-61. Colman I, Rothney A, Wright SC, Zilkalns B, Rowe BH. 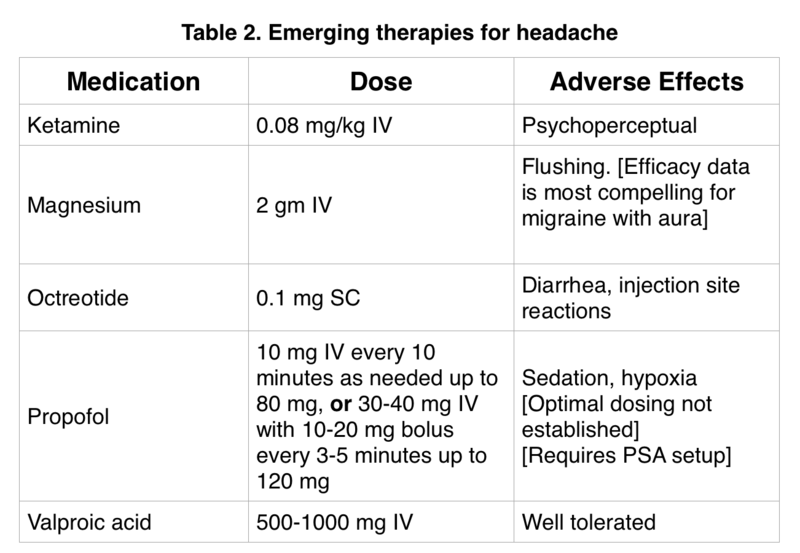 Use of narcotic analgesics in the emergency department treatment of migraine headache. Neurology. 2004 May 25;62(10):1695-700. Edlow JA, Panagos PD, Godwin SA, Thomas TL, Decker WW; American College of Emergency Physicians.. Clinical policy: critical issues in the evaluation and management of adult patients presenting to the emergency department with acute headache. Ann Emerg Med. 2008 Oct;52(4):407-36. Friedman BW, Bender B, Davitt M, Solorzano C, Paternoster J, Esses D, Bijur P, Gallagher EJ. A randomized trial of diphenhydramine as prophylaxis against metoclopramide-induced akathisia in nauseated emergency department patients. Ann Emerg Med. 2009 Mar;53(3):379-85. Friedman BW, Cabral L, Adewunmi V, Solorzano C, Esses D, Bijur PE, Gallagher EJ. Diphenhydramine as Adjuvant Therapy for Acute Migraine: An Emergency Department-Based Randomized Clinical Trial. Ann Emerg Med. 2016 Jan;67(1):32-39.e3. Friedman BW, Corbo J, Lipton RB, Bijur PE, Esses D, Solorzano C, Gallagher EJ. A trial of metoclopramide vs sumatriptan for the emergency department treatment of migraines. Neurology. 2005 Feb 8;64(3):463-8. Friedman BW, Garber L, Yoon A, Solorzano C, Wollowitz A, Esses D, Bijur PE, Gallagher EJ. Randomized trial of IV valproate vs metoclopramide vs ketorolac for acute migraine. Neurology. 2014 Mar 18;82(11):976-83. Friedman BW, Hochberg ML, Esses D, Grosberg B, Corbo J, Toosi B, Meyer RH, Bijur PE, Lipton RB, Gallagher EJ. Applying the International Classification of Headache Disorders to the emergency department: an assessment of reproducibility and the frequency with which a unique diagnosis can be assigned to every acute headache presentation. Ann Emerg Med. 2007 Apr;49(4):409-19, 419.e1-9. Friedman BW, Hochberg ML, Esses D, Grosberg BM, Rothberg D, Bernstein B, Bijur PE, Lipton RB, Gallagher EJ. Recurrence of primary headache disorders after emergency department discharge: frequency and predictors of poor pain and functional outcomes. Ann Emerg Med. 2008 Dec;52(6):696-704. Friedman BW, Kapoor A, Friedman MS, Hochberg ML, Rowe BH. The relative efficacy of meperidine for the treatment of acute migraine: a meta-analysis of randomized controlled trials. Ann Emerg Med. 2008 Dec;52(6):705-13. Friedman BW, Mistry B, West JR, Wollowitz A. The association between headache and elevated blood pressure among patients presenting to an ED. Am J Emerg Med. 2014 Sep;32(9):976-81. Friedman BW, West J, Vinson DR, Minen MT, Restivo A, Gallagher EJ. Current management of migraine in US emergency departments: an analysis of the National Hospital Ambulatory Medical Care Survey. Cephalalgia. 2015 Apr;35(4):301-9. Gantenbein AR, Lutz NJ, Riederer F, Sándor PS. Efficacy and safety of 121 injections of the greater occipital nerve in episodic and chronic cluster headache. Cephalalgia. 2012 Jun;32(8):630-4. Headache Classification Committee of the International Headache Society (IHS).. The International Classification of Headache Disorders, 3rd edition (beta version). Cephalalgia. 2013 Jul;33(9):629-808. Kapicioğlu S, Gökce E, Kapicioğlu Z, Ovali E. Treatment of migraine attackswith a long-acting somatostatin analogue (octreotide, SMS 201-995). Cephalalgia. 1997 Feb;17(1):27-30. Kelly AM, Walcynski T, Gunn B. The relative efficacy of phenothiazines for the treatment of acute migraine: a meta-analysis. Headache. 2009 Oct;49(9):1324-32. Kristoffersen ES, Lundqvist C. Medication-overuse headache: epidemiology, diagnosis and treatment. Ther Adv Drug Saf. 2014 Apr;5(2):87-99. Law S, Derry S, Moore RA. Triptans for acute cluster headache. Cochrane Database Syst Rev. 2013 Jul 17;(7):CD008042. Leone M, D’Amico D, Frediani F, Moschiano F, Grazzi L, Attanasio A, Bussone G. Verapamil in the prophylaxis of episodic cluster headache: a double-blind study versus placebo. Neurology. 2000 Mar 28;54(6):1382-5. Loder E. Triptan therapy in migraine. N Engl J Med. 2010 Jul 1;363(1):63-70. Miner JR, Fish SJ, Smith SW, Biros MH. 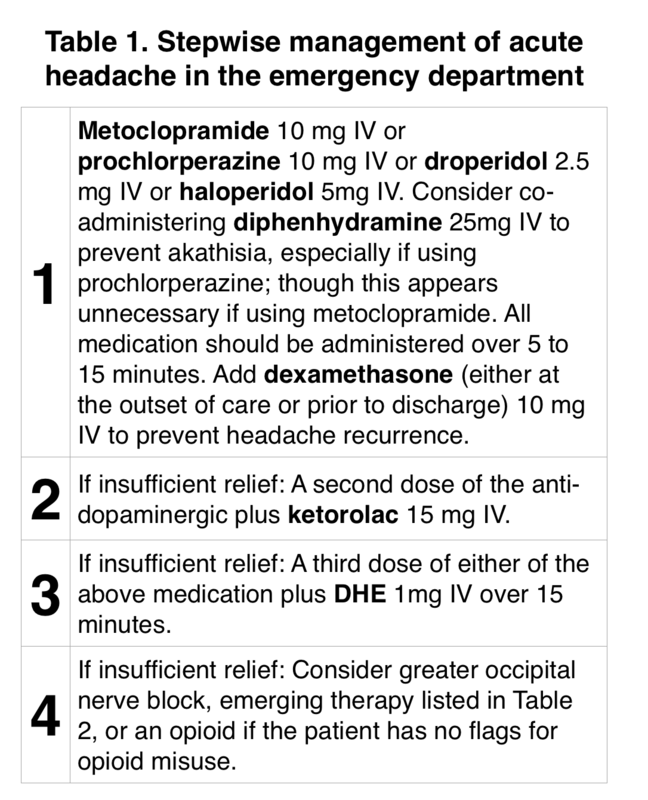 Droperidol vs. prochlorperazine for benign headaches in the emergency department. Acad Emerg Med. 2001 Sep;8(9):873-9. Natoli JL, Manack A, Dean B, Butler Q, Turkel CC, Stovner L, Lipton RB. Global prevalence of chronic migraine: a systematic review. Cephalalgia. 2010 May;30(5):599-609. Nicolodi M, Sicuteri F. Exploration of NMDA receptors in migraine: therapeutic and theoretic implications. Int J Clin Pharmacol Res. 1995;15(5-6):181-9. Oldman AD, Smith LA, McQuay HJ, Moore RA. Pharmacological treatments for acute migraine: quantitative systematic review. Pain. 2002 Jun;97(3):247-57. Orr SL, Aubé M, Becker WJ, Davenport WJ, Dilli E, Dodick D, Giammarco R, Gladstone J, Leroux E, Pim H, Dickinson G, Christie SN. Canadian Headache Society systematic review and recommendations on the treatment of migraine pain in emergency settings. Cephalalgia. 2015 Mar;35(3):271-84. POZEN 2005. “The Efficacy And Safety Of MT100 (Metoclopramide/Naproxen Sodium) In The Acute Treatment Of Migraine”. Webcache.googleusercontent.com. N.p., 2016. Web. 6 Dec. 2016. Pringsheim T, Davenport W, Mackie G, Worthington I, Aubé M, Christie SN, Gladstone J, Becker WJ; Canadian Headache Society Prophylactic Guidelines Development Group.. Canadian Headache Society guideline for migraine prophylaxis. Can J Neurol Sci. 2012 Mar;39(2 Suppl 2):S1-59. Raskin NH. Repetitive intravenous dihydroergotamine as therapy for intractable migraine. Neurology. 1986 Jul;36(7):995-7. Regan LA, Hoffman RS, Nelson LS. Slower infusion of metoclopramide decreases the rate of akathisia. Am J Emerg Med. 2009 May;27(4):475-80. Rozen TD. Olanzapine as an abortive agent for cluster headache. Headache. 2001 Sep;41(8):813-6. Soleimanpour H, Taheraghdam A, Ghafouri RR, Taghizadieh A, Marjany K, Soleimanpour M. Improvement of refractory migraine headache by propofol: case series. Int J Emerg Med. 2012 May 15;5(1):19. Taggart E, Doran S, Kokotillo A, Campbell S, Villa-Roel C, Rowe BH. Ketorolac in the treatment of acute migraine: a systematic review. Headache. 2013 Feb;53(2):277-87. Tfelt-Hansen P, Henry P, Mulder LJ, Scheldewaert RG, Schoenen J, Chazot G. The effectiveness of combined oral lysine acetylsalicylate and metoclopramide compared with oral sumatriptan for migraine. Lancet. 1995 Oct 7;346(8980):923-6. The Oral Sumatriptan and Aspirin plus Metoclopramide Comparative Study Group. A study to compare oral sumatriptan with oral aspirin plus oral metoclopramide in the acute treatment of migraine. Eur Neurol. 1992;32(3):177-84. Vinson DR, Migala AF, Quesenberry CP Jr. Slow infusion for the prevention of akathisia induced by prochlorperazine: a randomized controlled trial. J Emerg Med. 2001 Feb;20(2):113-9. Vinson DR. Diphenhydramine in the treatment of akathisia induced by prochlorperazine. J Emerg Med. 2004 Apr;26(3):265-70. Weaver CS, Jones JB, Chisholm CD, Foley MJ, Giles BK, Somerville GG, Brizendine EJ, Cordell WH. Droperidol vs prochlorperazine for the treatment of acute headache. J Emerg Med. 2004 Feb;26(2):145-50. Weinman D, Nicastro O, Akala O, Friedman BW. Parenteral treatment of episodic tension-type headache: a systematic review. Headache. 2014 Feb;54(2):260-8.